The other day, I had to buy a set of definitives issued in Gibraltar in 1999.They are an adaptation of the 1950s British Wilding definitives. They more or less used the frame originally designed by G. T. Knipe, and placed a different Wilding portrait in the centre. It's not the most beautiful of stamp designs, I must admit, and I wonder why it saw the light of day anyway. Gibraltar never used to have a Wilding definitive set in the first place. They just had pictorials (quite nice ones though) and later more thematically based sets. So it can't have been a nostalgic look back. 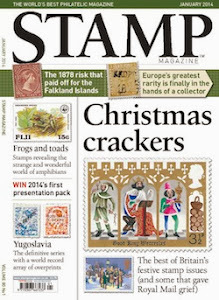 More likely is that they jumped on the bandwagon when Britain started reissuing their Wilding stamps. But anyway, it reminded me of one of my silly pet grievances when it comes to the reissued Wildings. I don't normally lose any sleep over that, but now that there's another one added to the list, it rears its ugly head again. 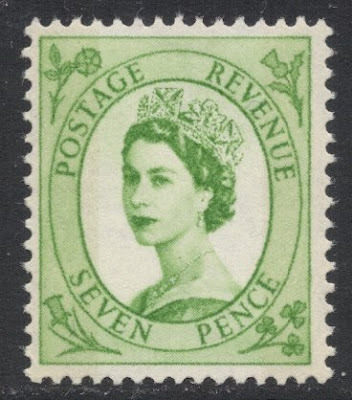 So there we were, in the 1950s and 1960s, enjoying our Wilding stamps, and among them was this nice one by Mr George Knipe. I quite like this one as the frame is not too fussy, though I must admit I like all designs in that set. And so I was quite pleased at the time when they chose this design for the first reissued Wildings, in 1998. 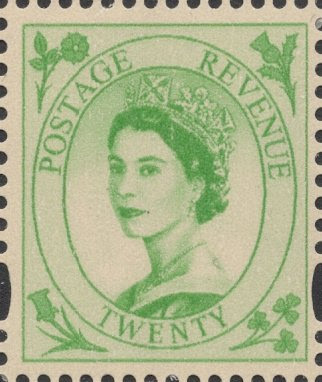 They were part of the multi-year promotion of the Stamp Show 2000. They looked gorgeous, I thought, and I used loads of them on my mail. But then, shock horror, Royal mail started milking it a bit and used the designs again and again for various (royal) celebrations, such as the Golden Jubilee, and the 50th Anniversary of the Wilding stamps themselves. Which would have been fine as well, if it weren't for the fact that they absolutely ruined the whole design. Look at it, what monstrosity! Apparently, Royal Mail had received too many complaints about the 1998 reissues. People thought them too clean, too modern and too white. So what Royal Mail did was fuzzy up the design a bit and colour the paper as well, with the above dismal result. 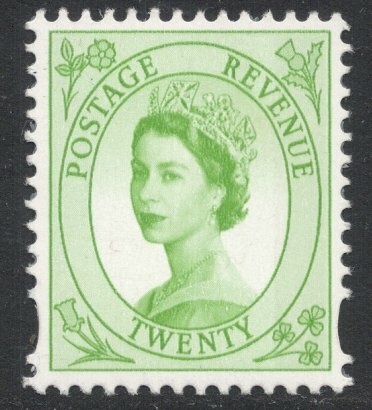 So, if those persons who wrote in to complain about the 1998 stamps are still around and reading this: Fie! Hang your heads in shame! 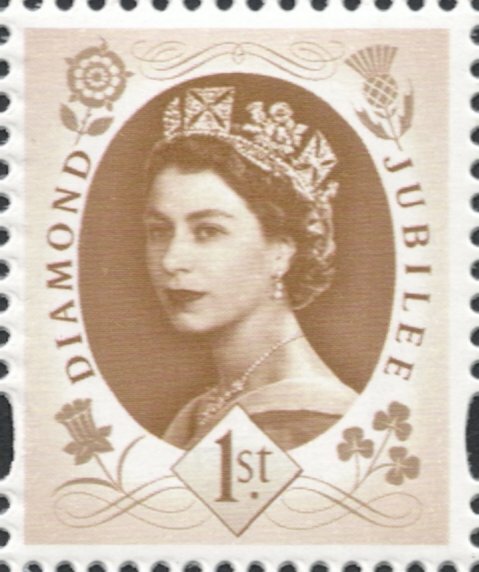 And now the latest Wilding reissue is upon us, as part of the Diamond Jubilee miniature sheet issued earlier this week. It is not the Knipe design that was used, so that rather upsets the delicate design and colour balance of my carefully selected illustrations, but Edmund Dulac's. I'm very happy to see that Royal Mail has mended its ways and has reverted to the clean 1998 way of reuissuing the Wildings. The new 1st class Wilding is a lovely stamp, and is part of an absolutely brilliant miniature sheet. In fact, I like it so much, I would already venture to state that it is this year's best issue. 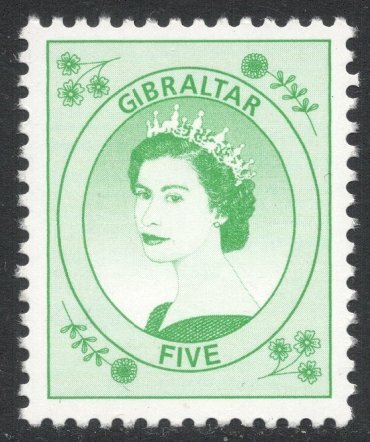 I also judge the design of the Gibraltar stamp terrible. Look to the lines of shoulder and neck. Afreux! That shouldn't've got through the quality checks, surely?